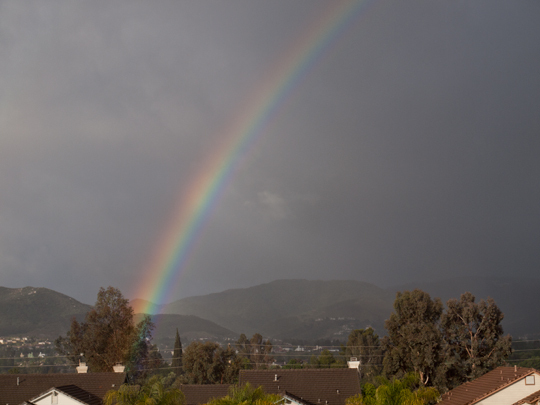 It was 7:00AM on Sunday, May 29 while photographing early morning rainbows that my attention was drawn to a number of agitated crows in our front yard. I turned to see what had prompted all the commotion. 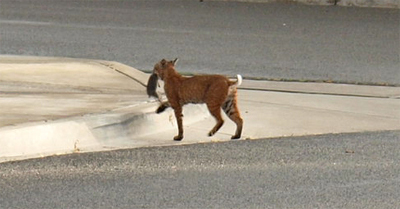 Crossing the street was a bobcat with a live rabbit clamped in its jaws. The bobcat casually moved along with its ears cocked back in the direction of the crows. The bobcat took its time as it wound its way across our neighbor’s front porch, into their backyard, then over their back wall and into the dense chaparral. 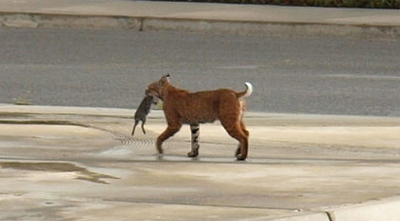 Bobcat with prey passing neighbors front porch possibly heading for her den. It was last year on the 25th of May that a female bobcat visited our front porch with two kittens. It was a brief appearance and the bobcat family departed before I was able to locate my camera. This sighting occurred within minutes of learning of the passing of Judy’s beloved uncle Bernie. At the time we thanked Bernie for his gift of sending the bobcat family to our front door. Bernie, a self-taught naturalist, has been a great influence and inspiration to both Judy and I.
I saw a bobcat about a month ago as it passed by our front porch but it disappeared by the time I got outside. At the time I thought about Bernie and hoped that we would see the bobcat again soon. I’m assuming that this year’s bobcat is the same that paid us a visit with her family last year. At that time I thought the bobcat probably had her den in the green-space, our extended backyard, adjacent to our home. This space comprises nearly 300 acres of grassland, chaparral, and oak woodlands. This Sunday’s bobcat sighting would however indicate otherwise. 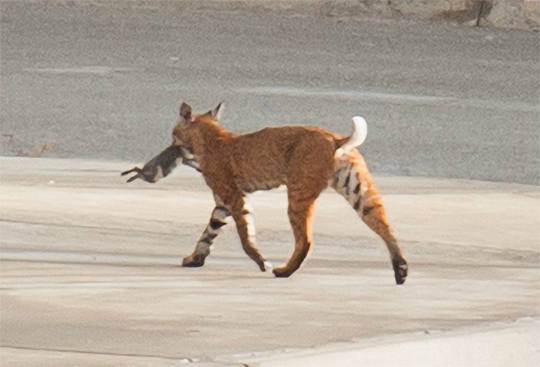 Sunday’s bobcat was carrying live prey into the development. Live prey would suggest that the bobcat had young and she was taking the live prey to her den. The purpose of live prey is to provide her young with a necessary lesson in successful predation. It is more than likely that the bobcat’s den is located within our development. This actually makes good sense. The housing development would provide the bobcat with better protection from her natural enemies than would the adjacent green space. 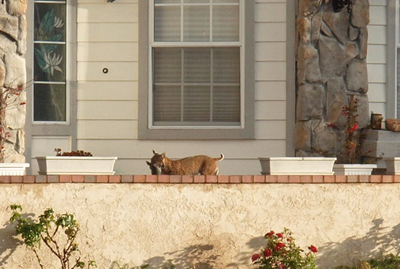 Apparently this bobcat has adapted to our human community and we welcome her and her family as good neighbors. I provided our neighbor with a photo of the bobcat that graced his front porch. He then told me that he and his wife occasionally see the bobcat in their backyard. This would further suggest that her den is probably below their back wall in the dense chaparral and eucalyptus trees. I’ll be heeding the crows in hopes of seeing this beautiful animal and family again soon. The California Settlers are now reasonably settled. The initial “shock and awe” experienced by settlers arriving at their new location has waned a bit and everyone has calmed down becoming more comfortable and familiar with the new surroundings. Jim no longer takes 100’s of photos of sunsets, sunrises, clouds, plants, animals, and anything else that catches his eye in the process of exploring the new area. He is now more discriminate with his photo selections. He now concentrates on finding the better shot of what he already has and spending time cataloging the photos to see what he is missing. Jim and Judy have become more involved with local activities. Judy continues to improve her garden and is active in the Temecula Garden Club. 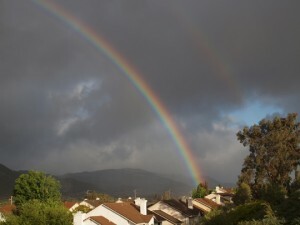 Jim is active with the Santa Rosa Plateau (SRP) and is leading 3rd-grade students on Nature Hikes several times a week. Judy has also been volunteering at the SRP occasionally working at the SRP Visitor Center and finding it a lot of fun. I have settled in as well. I no longer run and hide on Thursday’s when the trash trucks arrive, nor do I run and hide every time the doorbell rings. The skateboarders however still bother me somewhat. Karter my next door neighbor comes by most every day and we converse through the screen – he from the outside and me on the inside. He is a big showoff and occasionally drops off a present at our back door demonstrating his hunting prowess. When I am not napping, begging for food, lying stretched out absorbing the sunlight, rubbing against Jim and Judy’s legs, or stomping all over them in the middle of the night, I have been studying the geology of our new location. I learned that we are residing in a GRABEN. I suggested to Jim that we probably ought to change the name of our BLOG now that we are comfortably settled in. My suggestion was to name the BLOG to “From the Graben.” I further suggested that Jim create an illustration explaining a GRABEN (see below). Part of my rationale is that From the Graben would best describe the specific area where we now reside, not to mention that I love that sinking feeling. GRABEN – In geology, a graben is a depressed block of land bordered by parallel faults. 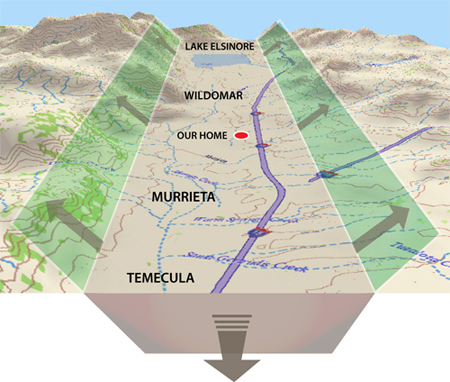 faults typically dip toward the center of the graben from both sides.